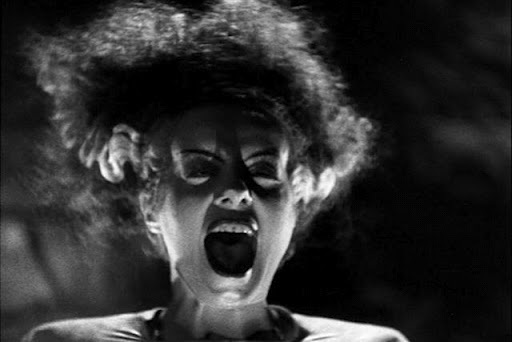 You know in the Frankenstein franchise where the good doctor tried to fix all those iggy little problems with bolt head, and made a beautiful wife for him…? 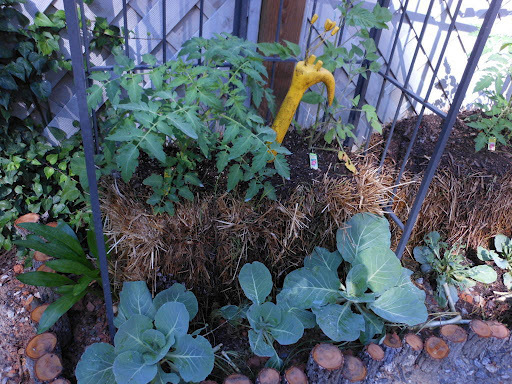 Well…I did the same thing to the straw bale garden this year… and consequently, got more than I bargained for. 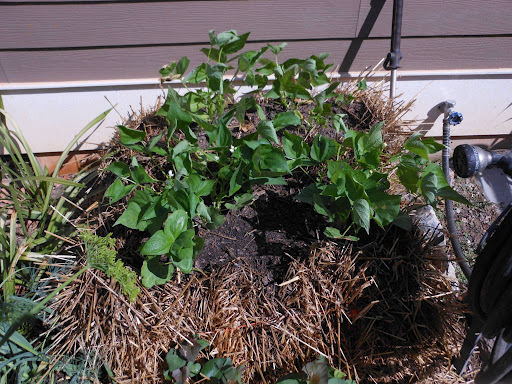 **Note: I wont be going into the Straw Bale Gardening set up this time – If you would like the instructions to create your very own hay bale garden – Click HERE and get the preparation instructions for the bales. You can also search Hay on the site and get all the previous years gardening updates and outcomes. Timing ended up being my big issue. I expected to be complete with the renovations by the 1st of May, and now at the end of the month, I’m still not finished. There is still a couple of loads of gravel to haul and spread… a potting shed to construct… and the last of the bed retainers. I think I’ll be through by September at this rate. 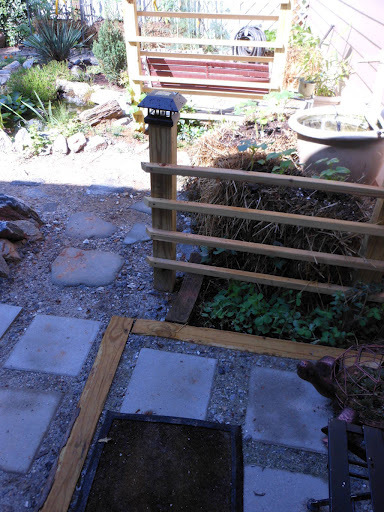 First – there was the nagging problem with the rain chains and lack of a workable rain barrel. With the plane and slope of the garage roof (and no way to move the water orderly out of the way), an insane amount of water has been pouring into the garden. The splatter was starting to water-log the siding paint and it’s was beginning to undermine the driveway in places where the wall of water skirted out under the fencing. 1 at the back of the garden to Catch the water off the garage roof. 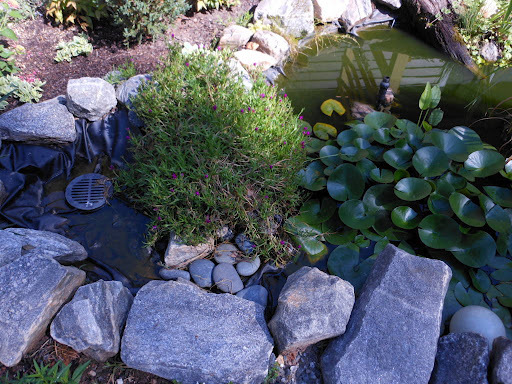 The pot was tilted to direct overflow into the gravel bed which houses a drain that feeds into the existing pond. 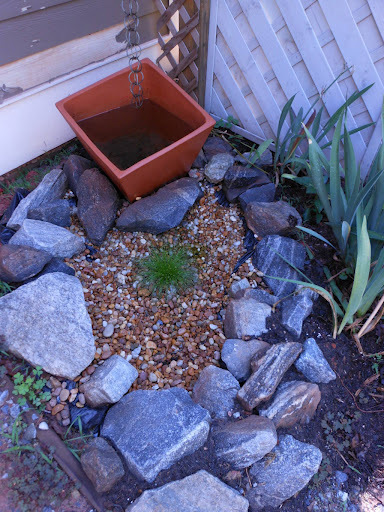 From there, I made a spillway off the pond with another catch basin and drain, which feeds under the pathways to the other rain chain location. With it’s very own tilted catch pot and gravel basin. 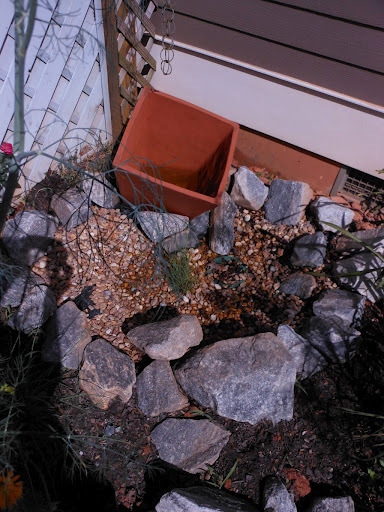 This connects up to the existing drainage system to pull all the water away from the house and out to the front Mountain Laurel beds. Next, I had to repair the wash out with the paths. The red clay area in the lower right is one of the 4 bored areas for footings on the “future” potting shed. 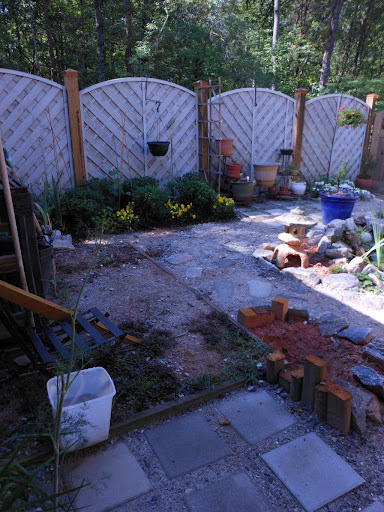 It will be a 6×6 post construction with a sloped tin roof and a 2′ perimeter trellis on 3 sides – complete with a compost bin, tool racks and pot shelves – to accompany the potting table Ed built last year. There has also been substantial re-landscaping to the central bed, ground cover planted in each of the concrete tiled areas, a vining rail and Mandevilla Trellis constructed. Then there was the issue with the bales themselves. I’ve found that just with the rotted hay bale; by late summer the material deteriorates so badly that keeping enough water captured in the bale become difficult. Each bale has had 1 Cubic Ft of standard garden soil pressed and watered in before planting this year – in hopes of maintaining the integrity of the bale longer. 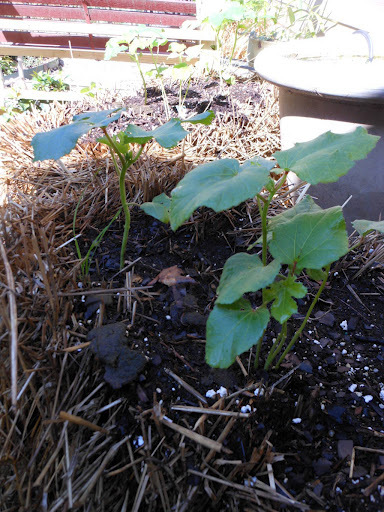 Additionally, with 2 full years of bales in the books – we’ve got enough mulch / medium (10 ” of hay mulch) to attempt growing directly in the ground this year. Half of the garden this year is “cluster gardening”. 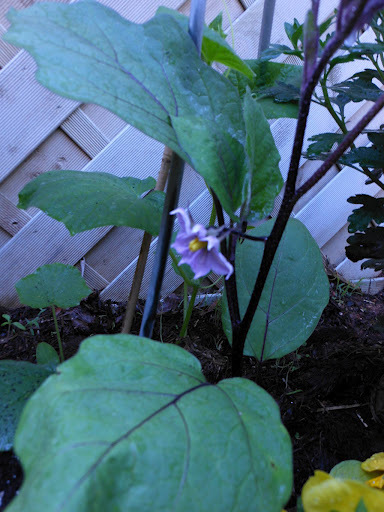 Peppers, some of the cukes, eggplant and some of the greens are planted in and around flowering plants in the mulch beds. I’m attempting to utilize the mums and marigolds as a natural insect deterrent to cut down on the insane number of white flies plaguing the garden. I’ll keep you posted on how that progresses. 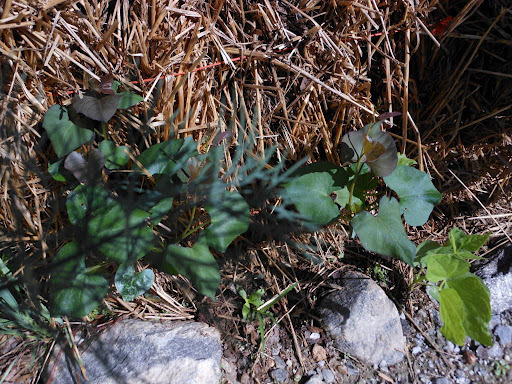 So – what’s in this year’s garden? I’ve opted not to do any crookneck or zucchini this year. With the produce swaps going around up here… there will be plenty without me adding to that mix. With last year’s carrot and beet disaster – I’ve opted not to try that again…I’m keeping it simple and manageable.